In a medium saucepan, over medium heat, melt the butter and the 12 ounces of semisweet chocolate chips. Stir constantly until just melted. Remove from heat and let stand for 5 minutes to slightly cool. In a large bowl, combine the brown sugar, eggs and vanilla. Beat with an electric hand-mixer, on medium speed just until blended. Beat in the cooled chocolate mixture just until combined. Add the cocoa powder, flour, baking powder and salt. Mix on low speed just until combined. Cover bowl with saran wrap and refrigerate for 2 hours. Preheat oven to 325 degrees F. Line two cookie sheets with parchment paper. Scoop and drop the cookie dough by the tablespoon, onto the prepared cookie sheets. You should fit 12 cookies per sheet, and making sure to space them at least 2 inches apart. Bake cookies for 12 minutes. Remove cookies from oven and place one piece of chocolate on the center top of each cookie, and then top each chocolate with one half marshmallow. Place cookies back in oven and bake another 4 minutes. Bigfoot-feet-shaped marshmallows I made for my investigation team. Stovetop: In a large pot over medium heat, whisk together milk, cinnamon, vanilla extract, and nutmeg. Add chocolate chips. Stir until chocolate is melted. Cover and turn heat to low for 5 minutes. For slow cooker: In a 4-quart slow cooker, whisk together milk, cinnamon, vanilla extract, and nutmeg. Add chocolate chips. Cover and cook on LOW setting for 2 to 3 hours, stirring every 15 to 20 minutes. Serve with a dusting of cocoa powder. 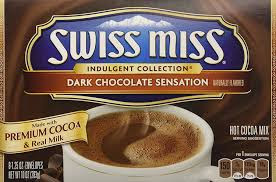 This isn't that watery milk chocolate weak stuff. This is rich and dark like a roasted coffee but sweet enough to not need a thing added to it. 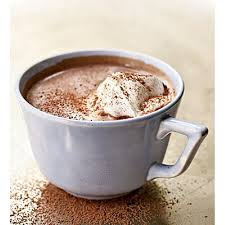 I tend to sprinkle it with cinnamon, ginger, and a dash of cayenne because I adore Mexican Hot Cocoa.